The China Open Boxing tournament 2011 is being held at the Guiyang Sports Gymnasium, Guiyang City, China from May 29 – June 03. A total of 140 boxers representing 20 countries are participating in this prestigious AIBA 3 Star Tournament. A large number of medallists from the World Women’s Boxing Championships 2010 at Barbados and Asian Games 2010 Guangzhou are also participating in this Tournament. The Local Organising Committee has announced cash awards of 3000 US Dollars for Gold Medallists, 2000 US Dollars for Silver Medallists and 1000 US Dollars for Bronze Medallists. 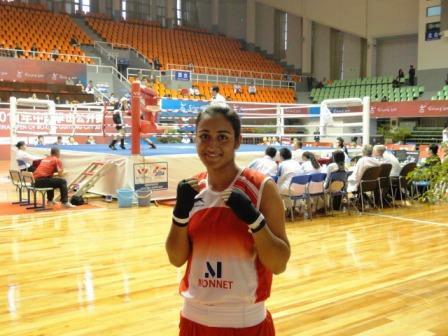 India had mixed luck as Sonia Lather (51 kgs) lost her quarterfinal bout to She Kebekova Jaina of Kazakhstan by a margin of 11:16 pts. The Kazakh boxer was shorter than Sonia and a south paw but her footwork and movements were superior. The round scores were 1:3, 3:7, 7:11 & 11:16. Sonia fought valiantly especially in the third and fourth round but unfortunately lost. Monica Saun (60 kgs) kept India’s flag flying high as she registered an emphatic win on pts 29:7 against Hlaing Kyu Kyu of Myanmar. Cheered vociferously by the Indian and Pakistani team members, she went on to win hands down. Round scores were 6:2,10:4, 19:5 & 29:7. Monica will now meet Asian Games Gold Medalist Dong Cheng of China in the semifinals on 02 June 2011. Pooja Rani (75 kgs) who got a bye will now meet Ning Yuyu of China Guizhou which is the second team from China in this Tournament.